Summer: On December 21st, sun rays directly lie in the tropic of Capricorn. So, it is the shortest day and longest night. On those days northern hemisphere experiences, coldness and southern hemisphere experience hotness. On those days northern hemisphere experiences winter season whereas southern hemisphere experiences summer season. Winter: On June 21st, the rays of the sun lies in the tropic of cancer. So, it is the shortest night and longest day. Northern hemisphere faces nearer towards the sun. So northern hemisphere experiences the longer day and shorter nights. On these days, northern hemisphere experiences hotness and southern hemisphere experience coldness. On those days, the northern hemisphere experiences summer season whereas southern hemisphere experiences a winter season. Autumn: On March 21st, the rays of the sun again lie on the equator. Day and night have a same interval of time. So, there will be no extreme hotness or coldness. On those days northern hemisphere experiences, spring season whereas southern hemisphere experiences the autumn season. Earth revolves around the sun in 365 days. On June 21st, the rays of the sun lies in tropic of cancer. On September 23, the rays of the sun exactly lies on the equator. On March 21st, the rays of the sun again lies on the equator. Day and night has same interval of time. On December 21st, sun of rays directly lies in tropic of Capricorn. So, it is shortest day and longest night. On December 21, sun rays directly lie in the tropic of Capricorn. Southern hemisphere faces nearer towards the sun. In those days, northern hemisphere experiences coldness and southern hemisphere experiences hotness. 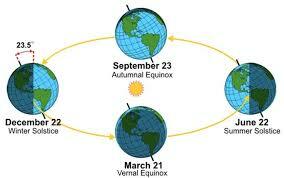 In those days, northern hemisphere experiences winter season whereas southern hemisphere experiences summer season. why does the time of a place become faster or slower?? On June 21st, the rays of the sun lies on ______. On September 23, the rays of the sun exactly lies on the ______. what will be defination for season change? ?